Six African athletes, three men and three women, have been nominated for the upcoming IAAF Athlete of the Year Award. The six are part of a list of 20 athletes released on Monday by the International Association of Athletics Federations (IAAF) as contenders of the prestigious award. The list, which comprises of 10 male and 10 female athletes, was prepared by an international board of experts in athletics, including representatives from at least six continental zones of the IAAF. “This week marks the opening of the voting process for the 2017 World Athletes of the year, ahead of the IAAF Athletics Awards 2017,” IAAF said in a statement on Monday. The world athletics body also announced that this year’s athletes of the year will be unveiled on November 24 in Monaco, Europe. Among the six African athletes nominated for the esteemed award is the South African 400m world record holder Wayde van Niekerk, Kenya’s female 5,000m marathon champion Hellen Obiri, and Ethiopia’s long-distance female runner Almaz Ayana Eba. The other three include Kenya’s Elijah Manangoi, a middle-distance runner, South Africa’s track and field athlete Luvo Manyonga, who specializes in Long Jump, and Caster Semenya, a South African middle-distance runner and 2016 Olympic Gold medalist. The six will battle it out with other world-class athletes like Mohamed Farah of Great Britain, Sam Kendricks of the United States, Anita Wlodarczyk of Polland, Sally Pearson of Australia, among others. According to IAAF, a three-way voting process will determine the finalists. The process involves casting of votes by the IAAF Council, IAAF Family and athletic fans within the six continental zones. The IAAF Council and Family will cast their votes via email, while fans will do so through the organization’s social media platforms. “The IAAF Council’s vote will count for 50% of the result, while the IAAF Family’s votes and the public votes will each count for 25% of the final result,” the statement further reads. They also promised to post each nominee’s graphics on Facebook and Twitter before the end of the week. Voting closes on October 16, after which the athletics body will announce the three male and three female finalists. Then the male and female World Athletes of the year will be declared live at the IAAF Athletics Awards 2017 in Monaco. 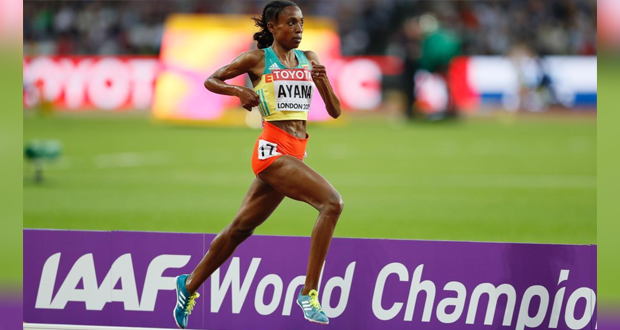 The IAAF Athlete of the year Award recognizes excellence in the various athletic sports organized by the IAAF, including track and field events, cross country racing, road races, and race-walking. Previous winners of the prized trophy include the Jamaican men’s 100m champion Usain Boltand the Kenyan men’s 800m champion David Rudisha.